Jordan McAllister can't cook her way out of a macaroni & cheese box, but filling in for the culinary reporter at The Ranchero Globe is better than writing personal ads. Her first assignment to review the new steakhouse in town is a disaster that ends with her waiter murdered outside her door-with her name and number in his pocket. Now Jordan is the prime suspect, as well as the main course on the murder menu. 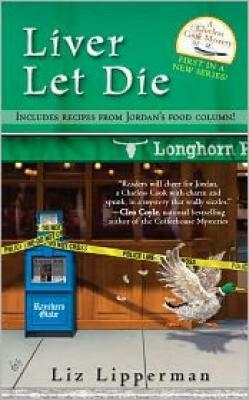 Liz Lipperman is the author of Liver Let Die, Beef Stolen-Off, and Murder for the Halibut. She spent many years working as a registered nurse saving lives before she gave in to her lifelong passion for finding ways to kill people and writing about them. Born and raised in Ohio, she lived in many places, including Saudi Arabia and Taiwan, before finally settling down in a small suburb north of Dallas. When she’s not writing, she enjoys all sports, especially the NFL, traveling, and spending time with her four grandchildren.